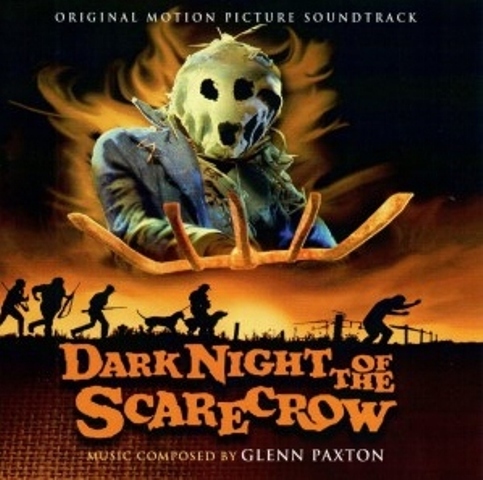 “Dark Night of the Scarecrow” – The Soundtrack! Shortly after the 4th of July, I stopped over at our local TARGET store and was annoyed to see that they’d already begun their “Back to School” sales. Although I understand the motivation of businesses for engaging in this long-standing practice of “pushing the holidays,” it still doesn’t prevent me from routinely rolling my eyes and getting irked by it. “Back to School” in July? Sheesh, let the poor kids enjoy their summer! Behind the large bins of notebooks, pens, and Elmer’s Glue (all supplies that will be as scarce as water in a desert a few short weeks from now) was a few items indicating yet another holiday was in the department store wings. Unlike the advent of a new school year or even Christmas, however, I greeted this occasion more as a welcomed friend along with the knowledge that a monster & horror fan’s favorite season is just around the corner.If you are reading this blog, its a good bet that you will agree that Halloween is one of the BEST holidays along with all the wonderful Fall festivities associated with it! Although this has ALWAYS been my favorite season, it has become even more enhanced after I became friends with the other Dave – David Albaugh. 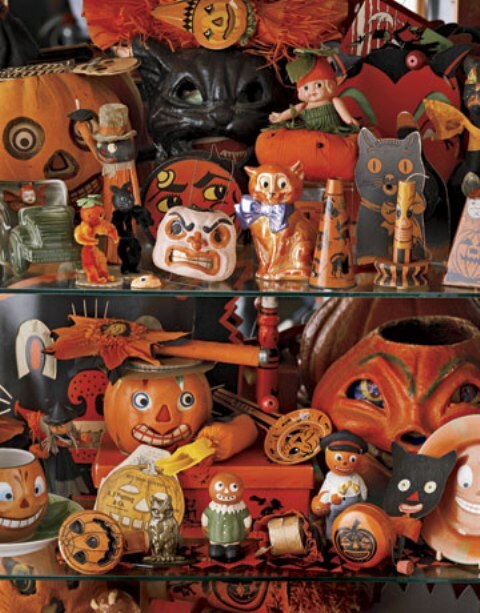 I was thrilled to discover that David not only has the same eclectic and bizarre taste in music as I do (we both love parodies, no doubt the result of growing up with the Son of Svengoolie), he also had a much more extensive collection of Halloween and novelty songs. Now, thanks to him, I have new Halloween hits to add to my playlist such as “Werecow,” Dr Demento’s Halloween specials, and a whole lot more! This past FRIGHT NIGHT FILM FESTIVAL saw a reunion of one of my favorite movies – DARK NIGHT OF SCARECROW. The DNOTS celebrities were not located with the main group of guests and could be found in back of the main convention hall. They were the main purpose of my making the trek down to Kentucky and, after I arrived, sought them out first and foremost! 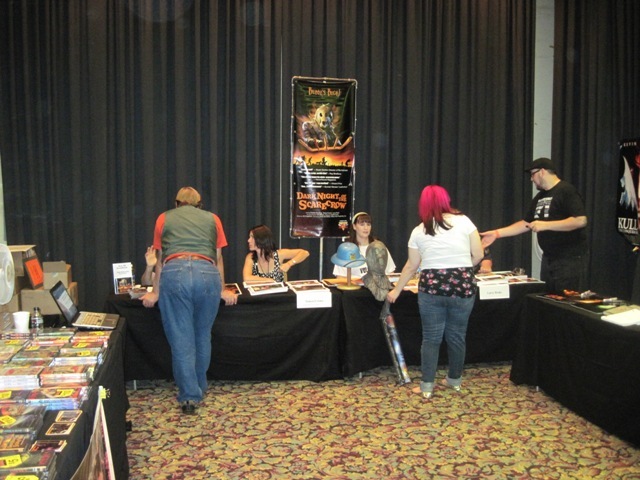 DNOTS celebs were located in the main dealer hall at FRIGHT NIGHT! The writer of DARK NIGHT OF THE SCARECROW, J.D. Feigelson gave me a warm greeting along with a nice surprise! On the table in front of him were some copies of the recently released DARK NIGHT OF THE SCARECROW motion picture soundtrack! As mentioned in a recent piece, although this was a made-for-TV movie, it was written and filmed as if it was a big screen production. The same approach can be said of its music! Although his first venture into scary films, composer Glenn Paxton manages to create one of the creepiest scores of all time. At the FRIGHT NIGHT Q&A panel, Feigelson even went as far as to say it is the second scariest soundtrack he’s ever heard! After listening to it back home during our own “dark nights,” both Daves would agree – its AWESOME! It is definitely creepy and will, no doubt, get lots of play in my household this Halloween season! I was listening to it while working at my desk at home and was afraid to look out my window for fear of seeing an ominous scarecrow sitting in my yard. Any fan of DARK NIGHT OF THE SCARECROW knows that this is a sure sign of impending DOOM! Fans of the film should also note that this soundtrack not only covers the movie as it was seen as TV but also has extra music that never made it into the final print. This insures that any horror “completest” is guaranteed to walk away happy! This soundtrack can be downloaded via itunes or purchased via AMAZON. Hurry up and add the DARK NIGHT OF THE SCARECROW soundtrack to your horror music collection today! Its a great Fall score and perfect for Halloween! Which, I’m sure you’ll agree, is one season that’s never too early to prepare for! This entry was posted in Music to Die For! and tagged DARK NIGHT OF THE SCARECROW, DR DEMENTO, FRIGHT NIGHT FILM FEST, Glenn Paxton, HALLOWEEN, Halloween Music, J.D. FEIGELSON, Werecow. Bookmark the permalink. ← Midnight Syndicate’s 13th Hour Arrives Not a Moment Too Soon!